A Chinese flag and Marriott flags flutter in front of a Marriott Hotel of Marriott International in Hangzhou, Zhejiang province, January 11, 2018. This piece was first published on the NYR Daily on March 2, 2018. A couple of years ago, a satirist on Taiwan, the democratic self-governing island that China claims as a province, created an online “Apologize to China” contest. Shortly before, an 18-year-old Taiwanese pop singer named Chou Tzu-yu had prompted patriotic outrage in mainland China when it was discovered that she had waved a Taiwanese flag on South Korean television, a gesture taken as disrespect for the sacrosanct One China idea. Facing furious demands that she be banned from performing in China, Chou made a video in which she tearfully begged for forgiveness for her offense, which itself aroused a good deal of dismay on Taiwan about Chinese bullying of a naive teenager. Hence the “Apologize to China” contest. Though they have been covered in the press, these apologies have received relatively little attention in the home countries of the companies involved. Yet they would seem to reflect two important trends, at a time when Western governments and experts on China are expressing ever-greater worries about the challenge to liberal-democratic values from the rise of authoritarian China—strikingly illustrated this week by Beijing’s announced intention of doing away with presidential term limits, a move aimed at concentrating even more power in the hands of the Communist Party leader, Xi Jinping, who is already the object of personality-cult-like veneration. One of these trends is China’s increasingly aggressive effort to control the public discourse about itself, not only in China itself but in other countries as well. The second is the evident willingness, even the eagerness, of major corporations doing business in China to accede to Beijing’s demands. The Daimler incident came when the publicity department of its subsidiary Mercedes-Benz posted a photo of a sleek, white car on Instagram, which is itself blocked in China, along with what was clearly intended as an inspirational quote from the Dalai Lama: “Look at situations from all angles, and you will become more open.” The Dalai Lama is officially viewed by China as a major public enemy—a “splittist” and a “wolf in sheep’s clothing.” So when the Internet in China lit up with complaints about Mercedes-Benz’s favorable reference to him, the corporation took rapid steps to halt a looming public relations disaster. Such would appear to be the moral cost of becoming dependent on doing business in China. Ten years ago, Mercedes sold fewer than 30,000 cars in China. Last year, its sales were more than 600,000 vehicles, which made China Daimler’s largest market by far—fully a quarter of the Mercedes brand’s global sales. It’s therefore not hard to understand why, when faced with the choice between defending the principle of free speech and yielding to China’s demands, Daimler readily chose the latter. The other companies that have also recently issued apologies to China—Delta Airlines, Qantas Airlines, the clothing designer Zara, the medical instruments maker Medtronic, and the Marriott International hotel chain (which includes luxury brands like Ritz-Carlton and St. Regis)—all appear to have the same reason to placate China as Daimler did. According to a Marriott press release, for example, 8 percent of the global total of the company’s rooms are in what it calls “Greater China,” meaning China plus Hong Kong, Macau, and Taiwan. That’s already a lot, but it will be more. Marriott says that 19 percent of the hotels currently being developed are also in Greater China, which clearly makes the country a major area of expansion for the chain. Marriott’s apology stemmed from an online customer survey that included a dropdown menu showing Taiwan, Tibet, Hong Kong, and Macau as separate “countries.” This aroused patriotic fury on social media in China, which led to the government’s demand that Marriott shut down its six Chinese-language websites and apps for a week. 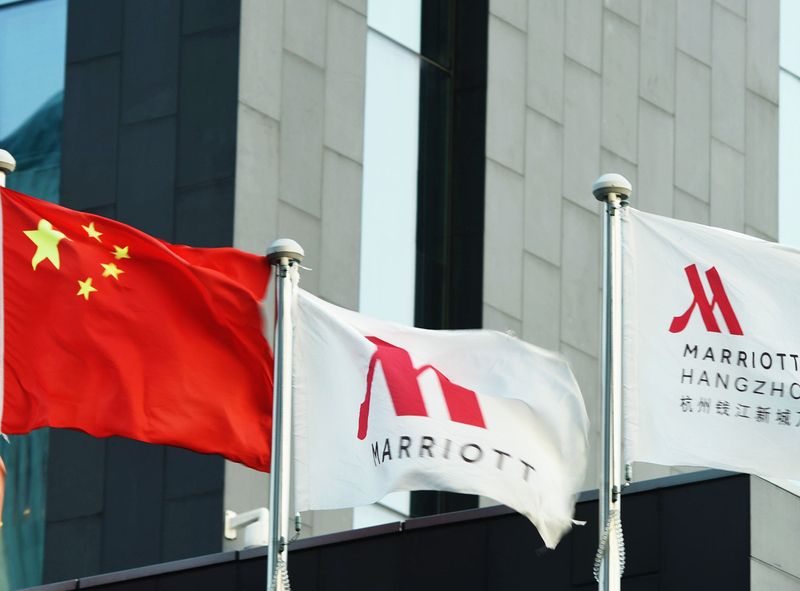 Marriott responded with a dutiful apology, reaffirming its “respect for the sovereignty and territorial integrity of China” and vowing “to actively seek advice and direction from [Chinese] government departments” in the future. Worse than promising to take direction from a one-party dictatorship was the company’s response to an incident that followed the appearance of its customer survey. When a pro-Tibet group tweeted approval of the survey’s identification of Tibet as a country, and a Marriott employee used a corporate Twitter account to “like” the tweet, Marriott fired that employee. For years, it has been common practice among airlines and other companies to list Taiwan separately from China, and Beijing has raised no objection. That it suddenly finds the practice offensive, and is demanding that companies put an end to it, could simply be part of China’s program to increase Taiwan’s international isolation, to make it pay for its election of a pro-independence president, Tsai Ing-wen, in May 2016. But China’s increased prickliness is not an isolated phenomenon. It seems part and parcel of a broader, more aggressive, and self-confident stance in the world that Xi has engineered over the past five years—and which includes an effort to shape and even censor the discourse on China in other countries. A new study by two independent research organizations in Germany—the Mercator Institute for China Studies and the Global Public Policy Institute—provides what is probably the most comprehensive and deeply researched description of what it calls Beijing’s “political influencing efforts.” The study is mostly concerned with Europe, but it draws on examples from around the world to depict an elaborate program involving several important government and Party bureaus through which China seeks to gain what the report describes as “preemptive obedience.” That includes demanding support for such policies as its One-Belt-One-Road infrastructure projects, its island-building in the South China Sea, and its moves to isolate Taiwan diplomatically, to build what it calls “strategic partnerships” with other authoritarian countries, to prevent honoring or legitimizing the Dalai Lama, to present its one-party system as a superior alternative to Western-style democracy, and to head off international criticism of its human rights violations. The German report shows how China uses “economic statecraft” to advance its goals in countries like austerity-straitened Greece and neo-authoritarian Hungary, whose populist leader Viktor Orbán has forged close ties to China. In March 2017, for example, Hungary refused to sign a joint European Union letter denouncing the torture of human rights lawyers in China. In June that year, Greece blocked an EU statement at the UN Human Rights Council criticizing China’s human rights record. It was the first time the EU had failed to deliver a joint statement on Chinese human rights violations. The ferocity of China’s complaints has, however, led many Western and other governments, including South Africa’s, to decline to meet with the Dalai Lama. The threats of economic retaliation, the mobilization of patriotic social-media fury, rigged protests, and demands for apology—for any activity involving Tibetan resistance to China’s repressive rule, any statement favorable to the Dalai Lama, or any expression of sympathy for the desire of democratic Taiwan not to become part of authoritarian China—are now well-established practices employed by China to enforce obedience to its dictates, beyond China’s borders as well as within them. Stellenbosch University resisted the pressure, but Daimler, Marriott, Delta, and other multinational corporations yielded to it. This does not augur well for the defense of liberal values in a world where China’s economic and political power, and its geographical reach, are only growing.